Monica (Williamson) Mills has been a member of HSC since 2007. She has served as a past HSC Director (2016-2018), HSC Vice President (2015), member of the Lady Gazelles Committee (2010-present), Chair of the Convention Merchandising Booth (2016), and past member of the HSC Membership Committee (2009-2011). Monica is a Lifetime member of the Houston Livestock Show and Rodeo and has been a committee volunteer since 1995 and is currently an Assistant Captain on the Breeders and Greeters Committee. 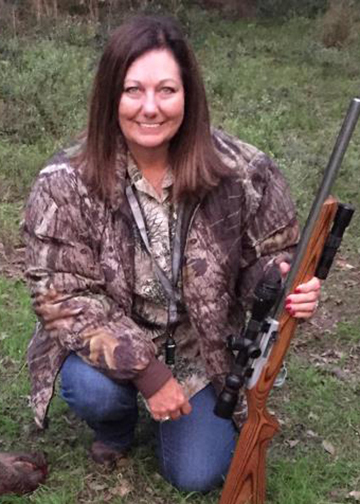 She is also a member of the NRA, Safari Club International, and Texas Fly Fishers of Houston. Monica enjoys doing anything outside, especially if it involves hunting or fly fishing! She enjoys reading, traveling and photography. Monica is a Proposal Manager at Boots & Coots, working with many legacy Red Adair oilfield firefighters. Monica is married to HSC life member, Greg Mills.